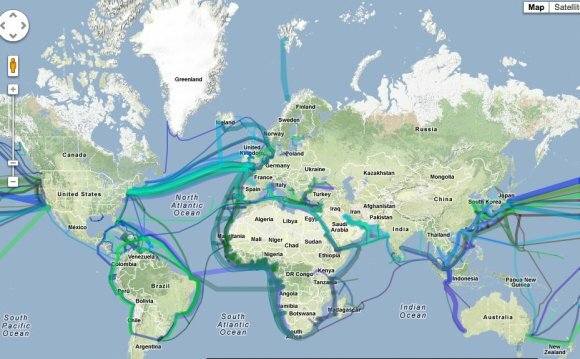 Undersea cables carry virtually all transoceanic Internet data these days, replacing satellites as the preferred medium. Google and some telecom companies have invested in one of them, called FASTER, that will stretch 9, 000 kilometers (5, 592 miles) between the U.S. and Japan and is due to go into operation next year. Here are some facts about undersea cables - and about the FASTER system in particular. 1. About 99% of all transoceanic Internet data is sent via undersea cables. That's a huge increase from around 1995, when about half went through satellites, which require data to travel far greater distances. A few hundred undersea cables link various parts of the world, and satellites are sometimes used to connect to remote areas and islands. 2. Submarine cables have to withstand the pressure of 8 km of water on top of them, roughly the equivalent of putting an elephant on your thumb. Yet the typical lightweight polyethylene cable for deep oceans from NEC, whose company OCC is supplying cable for FASTER, is only 17 millimeters (.7 inch) thick. Samples of submarine Internet cables, including an armored version (right). The factory run by OCC in Kitakyushu, Japan, is supplying cable for the Google-backed FASTER system that will link Japan and the U.S.
5. Closer to shore along continental shelves, submarine cable is usually armored. OCC manufactures it in versions including single armor and double armor. The single-armor version involves taking the lightweight cable, then adding more steel wires for strength, an asphalt coating to prevent corrosion, plastic strings to cover the asphalt and chalk powder to prevent the cable from sticking to itself. The process is repeated for the double-armor version. 6. Submarine cables can carry up to 80 Tbps, a capacity that's equivalent to transmitting 2, 100 DVDs (4.7 GB each) in one second, according to NEC. This sample of an Internet submarine cable from NEC shows the protective layers around the optical fibers including steel wires.